As we all know, fingers are the digits and are therefore used for counting. Then digits become numbers and if you store information it becomes digital. All rather dull really. But the Old English names for the fingers are far more interesting than all matters digital.. 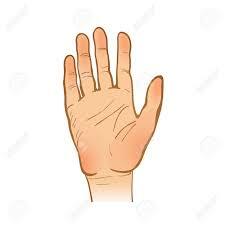 The index finger was once the towcher, or toucher, because it was used for touching things. Sadly we do not seem to use this finger for touching things and instead only point at, or indicate them. Hence index finger. You may from time to time run your index finger down the index of a book, but that’s not where the name comes from. The index of a book indicates where a passage may be found (and the index expurgatorius was a list of books that the fun loving Roman Catholic Church forbade its members to read). From this idea of indicating come all the other dull and dreary stock market and scientific indices….FTSE, NASDAQ etc etc. The rather dull-named middle finger was, to our forbears the fool’s finger. We got the name from the Romans who called it the digitus infamis (infamous), obscenus (obscene), and impudicus (rude). Nobody is sure why the Romans bore such a grudge against the middle finger, but it seems that it was they who invented the habit of sticking it up at those they did not like. Which brings me on to the fourth finger and the subject of leeches. A leech is an old metonym for a doctor, and doctors are interested in the heart. Because it was believed that there was a nerve that ran from the fourth finger to the heart, doctors thought that they could influence the one through the other. Lovers believe that by putting a ring around the fourth finger they had, so to speak, lassoed the loved one’s heart. And that’s how the leech finger became the ring finger. And the little finger? It was called the ear-finger. Why? Because it’s just the right size for digging wax from your ear.